Along Florida’s Suncoast, the name “Sophia, the Doggy Diva” has become synonymous with advocacy for abused, homeless and abandoned animals everywhere. 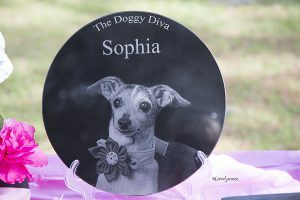 Since 2003, Sophia served as the canine “host” of “The Doggy Diva Show,” a weekly radio broadcast that airs every Saturday morning at 9:00 a.m. on speakuptalkradio.com. Throughout the regional animal community, Sophia was recognized for her passion for anything and everything “diva pink,” along with yummy treats and her famed “diva-licious” fashion sense. But life was not always filled with beautiful pink collars and pretty dresses for this tiny Italian Greyhound. Sophia was, in fact, a rescue dog herself who had spent the early years of her life chained to a tree day in and day out. Abandoned and neglected, Sophia suffered from an array of health issues that plagued her throughout her life. Thankfully, fate stepped in, and a rescue “angel” freed Sophia from the end of the chain that had imprisoned her for so long. When Sophia met the couple that would shower her with love and attention for the rest of her life, there was an instant bond, and Sophia happily joined them on the journey home, where she quickly adapted to her new life with four rescued brothers and sisters. Despite her tragic start in life, Sophia was destined to help others—she became “the voice of the voiceless,” advocating for all who were awaiting forever families of their own. In both her weekly radio show and as an editorial contributor to Suncoast Pet Magazine in her bi-monthly column, “Diva Delights,” Sophia took advantage of these multi-media platforms to share her message of “paying it forward” by donating both time and money to area rescues and shelters. She also promoted spaying/neutering all pets, adoption, fostering and volunteering. Most people who work in animal rescue agree that dogs and cats that have been rescued always seem to genuinely show their appreciation for how their lives have changed once they experience the love, kindness and compassion of their new families, and this certainly was true for Sophia. On September 28, 2013, when Sophia, the Doggy Diva, journeyed peacefully over the Rainbow Bridge, news spread instantly throughout the regional animal community, and thousands of her friends and fans mourned the passing of this beloved canine community advocate. But Sophia’s tireless work continues to live on in her weekly radio show, “The Doggy Diva Show,” and her bi-monthly column, “Diva Delights,” in Suncoast Pet magazine with a little help from a tiny new “Iggy diva,” who has taken Sophia’s spot at the microphone and computer. In the years since her passing, Sophia has guided other “sweet, little angels” into the lives of her mom and dad, who continue to miss her every day. And while it is true that there will never be another “Sophia, the Doggy Diva,” the lives of her family and friends forever have been changed by the once-neglected Italian Greyhound who, indeed, was an inspiration to all.